This trip is considered one of the best in the world according to the "World Class Rivers". We started the trip from Cusco, we drive along the river Apurimac during the 4 hrs. About 55 km, we are going to start crossing rapids class III, IV and V to The ultimate in boating is the degree VI, and this is reserved only for adventurers and well-trained experts. 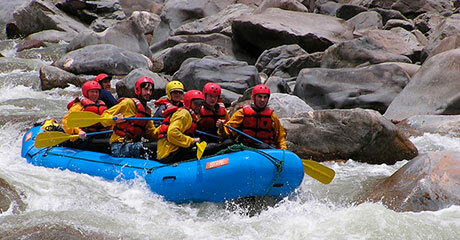 The route in Apurimac river is very demanding and requires total concentration. There will be a safety kayak as a companion per every raft , provides the necessary quiet in case of any mishap. Those familiar with the Apurimac always say it's him who's boss, so the river deserves all the respect possible. No precaution is more for those who dare to venture into its waters. Among the wildlife in this remote and isolated canyon we find river otters, wild cats, foxes, torrent ducks.etc. We meet at 09:00 hrs and we start our expedition, we start from Cusco, 4 hour bus ride crossing the Andes, arriving at Puente Huallpachaca located at 2900 meters altitude. After preparing all equipment will be given a safety briefing and exercises in the techniques of rafting. We will put emphasis on training of all participants, in the way back to the raft. We will be scouring the river for about 2 or 3 hours, rapids class II and III. Then we will camp in a narrow defile with impressive walls. Here the guides will prepare dinner, their responsibility is to help gather wood for cooking, and wash his own plate. After a healthy breakfast we start rafting at approximately 21:00 hrs. Today we are going to stay in the water for 6 hours, doing most of the class III and IV rapids, then we stopping for lunch and arrival at the camp around 16:00 hrs, today we will have afternoon tea, dinner. We will sleep in a sandy beach under the night sky of the southern hemisphere. After a good breakfast, we will enjoy 4 hours of rafting, we will run Class V rapids, with names like "toothache", "first," "Last Laugh", the whole journey, this trip is an unforgettable experience filled with adventure and surrounded by lush nature. We will return to Cusco arriving after lunch around 18:00 hrs. Full of boating equipment: wetsuit, life jacket, windbreaker suit, helmet, paddles. Cold lunch (entree, dessert, fruit, hot and cold drinks, bread, etc..), We also have options for vegetarians. This should be informed one day before departure. Private transportation from the hotel to the river and from the river to the hotel. Short, towel, sandals or slippers to enter the stream. Very exciting and risky, additional vessel is needed security can be a kayak or boat, is the highest level that can be done with tourists. Extreme risk, you can´t do rafting.